Crotchet AmazonUK AmazonUS Giuseppe VERDI (1813-1901). Il Trovatore - opera in four acts (1853). Recorded two years later, this is a companion to the Arts Archive La Traviata I reviewed recently . That was a performance originally made for TV transmission. I do not know if this recording originally had the same purpose. Certainly, except for some added bloom to Raina Kabaivanska�s Tacea la notte placida (CD 1 tr. 4), it has similarly good recording clarity and balance. Other common features are the excellent orchestral and choral forces used and Franco Bonisolli in the tenor lead. I found Bonisolli an ardent if not particularly sensitive Alfredo in Traviata and expected his more heroic tone and approach to be more suitable for Manrico. In the act 2 duet with Azucena he sings with strong lyric tone and expression (CD 1 trs. 11-14). Regrettably as the opera progresses his singing becomes coarse as he puts too much pressure on the voice with the tone becoming throaty and squeezed. He really overdoes the vocal histrionics in Ah! Si, ben mio and Di quella pira (CD 2 trs. 5 and 8) and makes a crude meal out of the concluding high note. His lover is the Bulgarian soprano Raina Kabaivanska (b. 1934). She made her La Scala debut in 1961 with Covent Garden and the Met following in 1962. Her fach was Verdi and Puccini as well as the title roles Francesca da Rimini, La Wally, and Adriana Lecouvreur. Like Bonisolli she had a strong stage presence. But with rival lyrico spintos such as Tebaldi contracted to Decca, Leontyne Price to RCA, Callas and Scotto to EMI, she did not appear on many recordings whilst at her vocal peak. Her voice is well-tuned and true but had developed a flutter by the time of this recording. Nor had she the colour of her famous contemporaries. Maybe the added resonance referred to seeks to cover up any vocal deficiencies, Her singing in the two great arias Tacea la notte placida and D�amour sull�ali rosee (CD 2 tr. 10) does nothing to erase memories of Leontyne Price in her 1969 recording with Domingo conducted by Mehta (RCA). Despite these reservations Kabaivanska characterises well and is fully involved in the unfolding drama. She launches the Miserere (CD 2 tr. 11) with commitment. Of the lower voices, Giorgio Zancanaro sings with well-coloured and covered tone as well as smooth legato. However, his characterisation of the role of the vengeful Di Luna is bland. Giulini in his 1984 recording of the work (DG) drew more involvement from Zancanaro than is found here. His Il Balen (CD 1 tr. 16) is beautifully sung and a pleasure to listen to, but for beautiful singing fired by characterisation in abundance turn to Viorica Cortez as Azucena, the gypsy who in her delirium threw her own child on the pyre. At one stage of composition Verdi had wanted to name the opera Azucena as she is very much at the centre of the story. Cortez�s portrayal here would justify that. Her singing and characterisation allied to beauty of tone and phrasing at least matches the distinguished portrayals of Cossotto (DG �Double� and RCA) and the other great Italian mezzos who have recorded the role. Her Stride la vampa (CD 1 tr. 9) and Ai nostri monti (CD 2 tr. 15) are veritable tours de force. Bruno Bartoletti, a man of the theatre, is inclined to give the participants their heads. Whilst this is to the benefit of the vibrant singing of Cortez, the downside is that his interpretation encourages Bonisolli into his cruder vocal manners. It has to be said that the tenor is little better in Karajan�s second studio recording of 1977 where he is partnered by a Leontyne Price somewhat past her sell-by date (EMI). 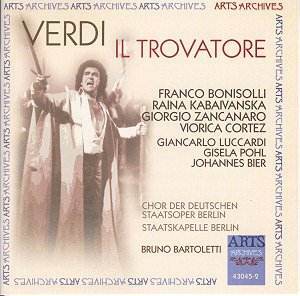 With the RCA set with Leontyne Price and Placido Domingo available at mid-price, and the DG �Double� with Carlo Bergonzi the most elegantly sung Manrico on CD in an all-Italian cast at bargain price, this issue will struggle to find a niche in the market. Despite that competition Viorica Cortez�s singing will appeal to many Verdians. The accompanying booklet has a short essay on the opera, a good synopsis, regrettably not track-related, in English, German and French. The libretto is given in full in Italian without any translation.